The Fantastic Four has always been a hugely popular superhero franchise, now the team are back to save the day in this brand new online slots game from Cryptologic. Blasting onto your screen in the form of a 25-payline, Fantastic four features a mass of in games features and bonus rounds on top of a very tasty progressive jackpot. The game is truly unique and boasts Cryptologic’s very best crafts, from the awesome design to the eye-catching animations. Speaking of which, players are treated to a really neat looking game, as Cryptologic have styled it with the comic theme in mind. 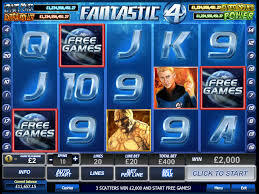 As this is part of the exclusive “Marvel” range, Fantastic Four is incorporated into the totally unique multilevel progressive jackpot – which is considered intermediately sized compared to others. The progressive is triggered randomly making the slot perfect for players of all wager requirements. Invisible Woman – Players are awarded one total bet plus 4 extra spins. During these spins, whenever the Invisible Woman appears at least once on the reels your multiplier grows by one making it potentially a really lucrative round. Human Torch: Here you are awarded with 4 extra spins during which the whole 1st reel is covered by Human Torch and held while the other four continually respin. The Thing: Players are awarded with 3 extra spins during and every time The Thing appears it becomes a wild and freezes in place for all of the remaining extra spins. Regardless of what character you are lucky enough to be graced with you will surely be impressed but the awesome animations that Cryptologic have included here. Throughout the slot in fact, players are treated to a range of money spinning features and there aren’t many moments when the slot isn’t delivering anything but pure excitement to your screen! If you like the sound of the Fantastic Four slot, you might like to have a go at the other Marvel slots such as Ironman and Incredible Hulk. Fantastic Four is a proper vintage online video slot if there ever was one. Every aspect of the game, form the theme to the bonus features just leaps from the screen and will surely be a fan favourite for years to come. You can check this Marvel slot game out at one of these top rated casinos – William Hill or Sky Vegas.